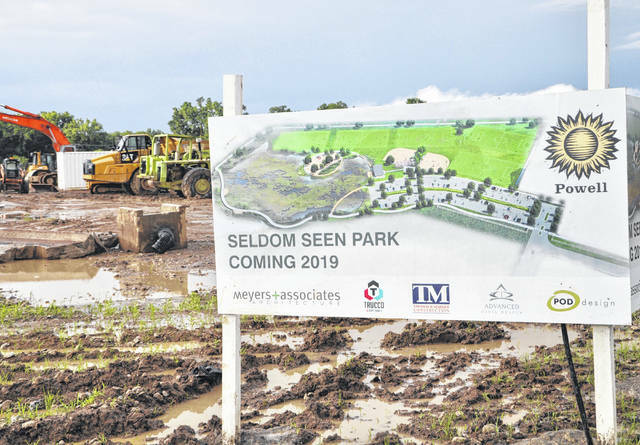 Construction crews have begun work on Seldom Seen Park in Powell. With some of the city’s infrastructure starting to show its age, a task force has come up with a recommendation to help fund necessary infrastructure improvements in the future. The plan involves raising the city’s income tax rate. This past January, Powell City Council approved a resolution to appoint 18 citizens to the Citizens Financial Review Task Force. The group was tasked with reviewing the city’s finances, while also making suggestions for future capital improvements. After meeting for six months, the task force presented its findings to council on Tuesday. Cline said the committee found that with the rapid growth of Powell over the past 30 years, combined with the reduction in infrastructure funding such as the Local Government Fund (LGF) and the estate tax, the city has sought out grants as a way to address the “shortfall.” He also added that in the past, the city has only done critical maintenance on its infrastructure. A 2010 proposal to increase the income tax in Powell for additional funding to support city operations failed at the ballot. Cline said the proposal failed, in large part, due to the lack of guarantee that the tax money would be devoted to infrastructure. “The task force and the city recognized the city cannot continue to provide safe and secure infrastructure under our current course of action,” Cline said. The task force was broken down into three subcommittees: Capital Needs, Revenues and Expenditure Review. Cline said the three committees worked completely independent of each other and had full control over how it went about its work. He also praised the variation in backgrounds the committees brought to the table. “Council did a fantastic job of selecting a wide cross-section of the Powell community when you set up this task force … we had a wide array of people with a wide array of experiences and thought processes, which proved to be invaluable in the work we did,” said Cline. The Capital Needs Committee addressed what the critical capital needs of the city were, how the city addresses those needs today, and what the city can do to improve that process. The committee’s findings were that the city does not generate sufficient revenue to maintain current infrastructures, such as streets, sewers and bike paths. The committee report suggested an additional $2 million in new revenue would be needed to properly fund the existing infrastructure. Cline said the city’s past plan of seeking grant money to maintain was not wise moving forward for several reasons, including the unreliability of even receiving the grants, and the fact that, typically, grants require the city to match the amount of the grant. He added that the city simply doesn’t have the money to match those funds in most cases. Expenditure Review analyzed where the city spends its money now, whether they’re spending that money wisely, and if there are ways of reallocating spending within the current budget to address capital improvement concerns. One of the options the Expenditure Review Committee considered was a 4 percent cut for every city department. However, Cline said that cut would have been particularly problematic for the police department, which accounts for a significant portion of the city’s budget. The proposed cuts would also only free up approximately $330,000 in revenue, far from the $2 million the Capital Needs Committee suggested is needed. In addition to the per capita comparisons, salaries for city employees in Powell are almost entirely below the average salaries of those similar positions around central Ohio. Ultimately, the committee’s suggestion to the city was to continue on as is, being “frugal and prudent” in its spending. For the Revenues Committee, the focal point was where the city generated its revenue today, whether the city was able to address its infrastructure maintenance needs using existing revenue, and if needed, the proper way to go about generating new revenue to fund infrastructure maintenance. The Revenues Committee pointed out that Powell’s income tax rate has remained unchanged for 27 years. At 0.75 percent, the rate is lower than 94 percent of municipalities in the state of Ohio, and lower than all of central Ohio. Given the cuts in the LGF and the loss of estate tax dollars, the committee suggested a ballot measure to “moderately raise” the income tax to 1.15 percent, while also increasing the credit for residents who pay taxes to the city in which they work from 0.25 percent to 0.50 percent. Also suggested with the ballot measure is a mandate that city council follows a “75/25” policy that would require no less than 25 percent of income tax dollars to be spent on infrastructure maintenance. Cline said the task force unanimously came to the final conclusion that city council proposing the income tax raise was the appropriate solution moving forward. Vice Mayor Tom Counts called the recommendation by the task force “first base,” and the group would need to get many more people onboard with the recommendation if the city is to implement it. There will be a public forum in the city council chambers from 6 to 8 p.m. on July 10 for residents and business owners to ask members of the task force about its findings and proposals. The final report from the task force can be found under the government section of the city’s website.